Our family has taken our poodles to Tipp City Veterinary Hospital for more than 20 years. Originally, Dr. Jim cared for our pets, but since we got our last poodle almost 7 years ago, Dr. Jacob primarily cared for her. Tipp City Veterinary Hospital has provided excellent care for our pets over the years, but I especially want to compliment and recognize Dr. Jacob and the staff who provided beyond exceptional care for our most recent poodle who had a number of extensive medical issues. For the last several years of our poodle’s life we were generally in at least monthly sometimes weekly or even more than once a week. Dr. Jacob did an excellent job treating our poodle and referring us to specialists as needed, and I am sure without his care and guidance our poodle would not have been able to live as long as she lived. We will always be loyal clients and highly recommend Tipp City Veterinary Hospital. They are wonderful, caring professionals whose love of animals is obvious. 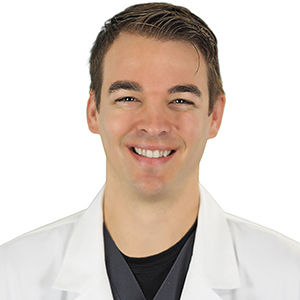 He enjoys taking on challenging cases and has a focused interest in cardiology and soft-tissue surgery. He resides in Tipp City. Outside of work, he enjoys reading, playing basketball and spending time with his wife. We want to thank Dr. Jacob and the staff at Tipp City Veterinary Hospital for taking such good care of our beloved Bernaise Mountain Dog, Bailee. He provided so much caring for ” our big girl” and support to us during her entire life. We have recommended Tipp City Veterinary Hospital to friends and family and we will return.